An important paper published today in the European Geosciences Union journal Earth System Dynamics uses polynomial cointegration to find "data for 1880–2007 do not support the anthropogenic interpretation of global warming during this period." The paper demonstrates "there is no relationship between temperature and the anthropogenic [man-made greenhouse gases] anomaly, once the warming effect of solar irradiance is taken into consideration." "Given the complexity of Earth’s climate, and our incomplete understanding of it, it is difﬁcult to attribute to carbon emissions and other anthropogenic phenomena the main cause for global warming in the 20th century. This is not an argument about physics, but an argument about data interpretation. ... However, our results challenge the data interpretation that since 1880 global warming was caused by anthropogenic phenomena." "scientists who make strong interpretations about the anthropogenic causes of recent global warming should be cautious. Our polynomial cointegration tests challenge their interpretation of the data." "we cannot rule out the possibility that recent global warming has an anthropogenic footprint. However, this possibility is very small, and is not statistically signiﬁcant at conventional levels." 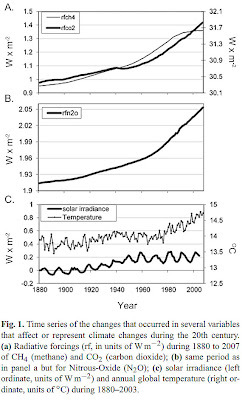 Panels a and b both show that there is no relationship between temperature and the anthropogenic [man-made greenhouse gases & aerosols] anomaly, once the warming effect of solar irradiance is taken into consideration. However, we ﬁnd that greenhouse gas forcings might have a temporary effect on global temperature. This result is illustrated in panel c of Fig. 3 in which the horizontal axis measures the change in the estimated anthropogenic trend. Panel c clearly shows that there is a positive relationship between temperature and the change in the anthropogenic anomaly once the warming effect of solar irradiance is taken into consideration. Currently, most of the evidence supporting AGW theory is obtained by calibration methods and the simulation of GCMs [Global Climate Models]. Calibration shows, e.g. Crowley (2000), that to explain the increase in temperature in the 20th century, and especially since 1970, it is necessary to specify a sufﬁciently strong anthropogenic effect. However, calibrators do not report tests for the statistical signiﬁcance of this effect, nor do they check whether the effect is spurious 12. The implication of our results is that the permanent effect is not statistically signiﬁcant. Nevertheless, there seems to be a temporary anthropogenic effect. If the effect is temporary rather than permanent, a doubling, say, of carbon emissions would have no long-run effect on Earth’s temperature, but it would increase it temporarily for some decades. Indeed, the increase in temperature during 1975–1995 and its subsequent stability are in our view related in this way to the acceleration in carbon emissions during the second half of the 20th century (Fig. 2). The policy implications of this result are major since an effect which is temporary is less serious than one that is permanent. The fact that since the mid 19th century Earth’s temperature is unrelated to anthropogenic forcings does not contravene the laws of thermodynamics, greenhouse theory, or any other physical theory. Given the complexity of Earth’s climate, and our incomplete understanding of it, it is difﬁcult to attribute to carbon emissions and other anthropogenic phenomena the main cause for global warming in the 20th century. This is not an argument about physics, but an argument about data interpretation. Do climate developments during the relatively recent past justify the interpretation that global warming was induced by anthropogenics during this period? Had Earth’s temperature not increased in the 20th century despite the increase in anthropogenic forcings (as was the case during the second half of the 19th century), this would not have constituted evidence against greenhouse theory. However, our results challenge the data interpretation that since 1880 global warming was caused by anthropogenic phenomena. Nor does the fact that during this period anthropogenic forcings are I (2), i.e. stationary in second differences, whereas Earth’s temperature and solar irradiance are I (1), i.e. stationary in ﬁrst differences, contravene any physical theory. For physical reasons it might be expected that over the millennia these variables should share the same order of integration; they should all be I (1) or all I (2), otherwise there would be persistent energy imbalance. However, during the last 150 yr there is no physical reason why these variables should share the same order of integration. However, the fact that they do not share the same order of integration over this period means that scientists who make strong interpretations about the anthropogenic causes of recent global warming should be cautious. Our polynomial cointegration tests challenge their interpretation of the data. Finally, all statistical tests are probabilistic and depend on the speciﬁcation of the model. Type 1 error refers to the probability of rejecting a hypothesis when it is true (false positive) and type 2 error refers to the probability of not rejecting a hypothesis when it is false (false negative). In our case the type 1 error is very small because anthropogenic forcing is I (1) with very low probability, and temperature is polynomially cointegrated with very low probability. Also we have experimented with a variety of model speciﬁcations and estimation methodologies. This means, however, that as with all hypotheses, our rejection of AGW is not absolute; it might be a false positive, and we cannot rule out the possibility that recent global warming has an anthropogenic footprint. However, this possibility is very small, and is not statistically signiﬁcant at conventional levels. Footnote 12 from above: GCMs embody hundreds if not thousands of unknown parameters to be calibrated. In practice this leaves few if any degrees of freedom to carry out meaningful statistical tests. This explains why observationally similar GCMs often generate quite different forecasts. Abstract. We use statistical methods for nonstationary time series to test the anthropogenic interpretation of global warming (AGW), according to which an increase in atmospheric greenhouse gas concentrations raised global temperature in the 20th century. Specifically, the methodology of polynomial cointegration is used to test AGW since during the observation period (1880–2007) global temperature and solar irradiance are stationary in 1st differences, whereas greenhouse gas and aerosol forcings are stationary in 2nd differences. 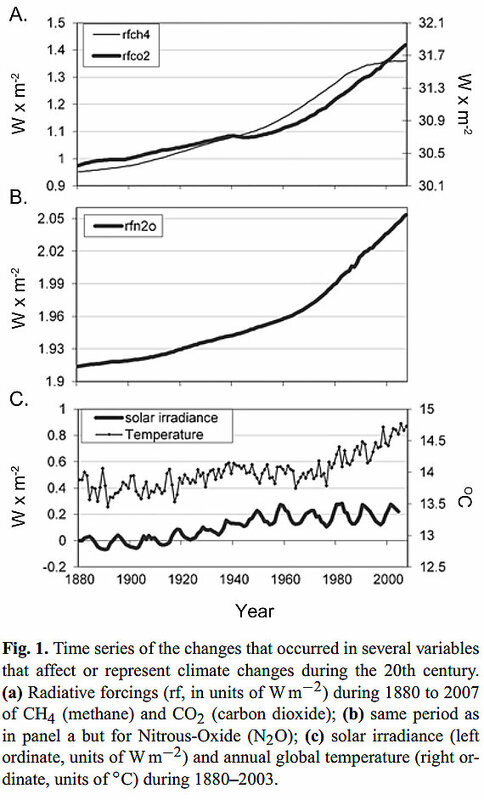 We show that although these anthropogenic forcings share a common stochastic trend, this trend is empirically independent of the stochastic trend in temperature and solar irradiance. Therefore, greenhouse gas forcing, aerosols, solar irradiance and global temperature are not polynomially cointegrated, and the perceived relationship between these variables is a spurious regression phenomenon. On the other hand, we find that greenhouse gas forcings might have had a temporary effect on global temperature. See the post by Danley Wolfe on Anthony Waats Wattsupwiththat blog http://wattsupwiththat.com/2014/09/12/a-look-at-carbon-dioxide-vs-global-temperature/ which make similar points on total lack of / zero correlation for two thirds of the Mauna Loa - NASA GISS data set from 1959 through 2014 to date. For the hiatus period from 1998-2014 R squared is 0.00068 and using this as the base gives a calculated climate sensitivity of 0.1 deg C. The consensus would argue that this ignores the effect of other variables such as aerosols, solar variability, southern oscillation, the point is IPCC claims in AR5 that the likelihood of human cause dominating global warming is >95%, If this were true you would see the response to the 25% increase in CO2 and not a complete hiatus, the picture is very convincing.